Today, when musical products are churned out in factories like so many sausages, it's heartening to see a true original like Divided by 13 - as close to bespoke amps as you can get - rise to the surface. In just a few short years, Fred Taccone has gone from amp tinkerer to amp builder to the stars, providing power for the likes of Rusty Anderson (Paul McCartney, Elton John), Dave Grohl, Billy Gibbons, and Tom Petty, among others. What has made his amps so coveted is his personalized approach to each and every client -- he listens to what each player wants, and sets about building an amp to his or her own specific needs. In many cases, the letters in the model's name represent the initials of the person that requested the design, while the numbers represent the output power. The EDT 13/29 was developed in response to a request from Evan D. Taubenfeld, who wanted an amp for his younger brother as a graduation present from Berklee. Evan envisioned a 1x12 combo but one with a little more clean headroom and the potential of getting more aggressive at lower levels. Fred put on his thinking cap and got to work. The result is one of Divided by 13's most versatile amplifiers to date. With almost unlimited capabilities, the EDT 13/29 captures a perfect merger of classic American and British cleans to overdriven tones and voicings -- all in a relatively small and portable 1x12 combo. 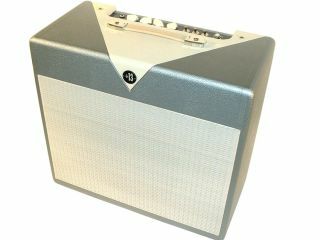 1x12 (Celestion Vintage 30), 4, 8, 16 Ohm output, dimensions: 21H x 22W x 10.5D. Available colours: Black, Cream, Forest Green, Purple, Plum, Red, Gold, Silver, Royal Blue, Orange, Navy Blue. The EDT 13/29 is available for $2,950 US list. In the coming weeks, MusicRadar will offer a review of the amp, as well as an interview with Fred Taccone of Divided by 13.